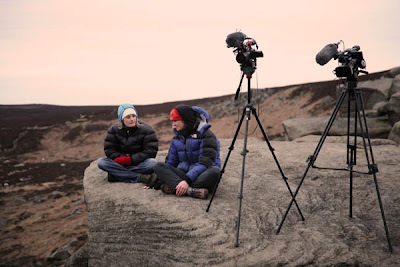 From a first ascent on the grit we then headed north to the Scottish Highlands for another of our film projects The AllRounder and an appointment to film Dave MacLeod. Something was wrong. We arrived in Fort William to pick Dave up at 6pm, but he wasn't there. 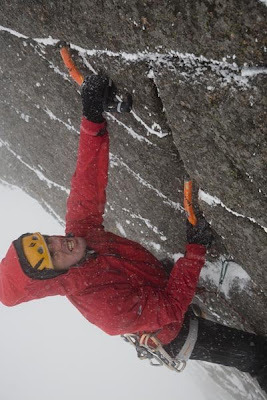 Almost certainly he must have found a belayer and gone again up to his winter project on Ben Nevis? 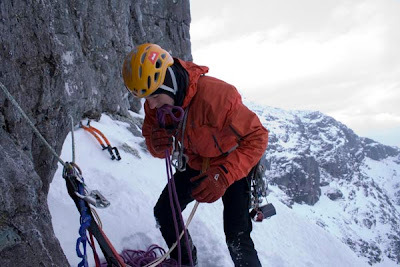 Dave MacLeod attempting his Ben Nevis project in 2006, XI,11. Hot Aches Images. I had been up to the route two years ago with Dave to second him and take photos. 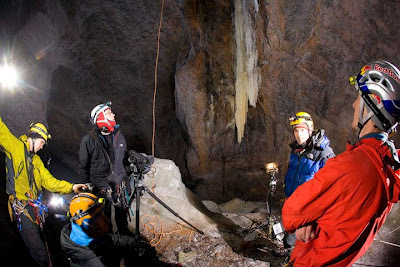 I recall a frigid three hours at that first belay. 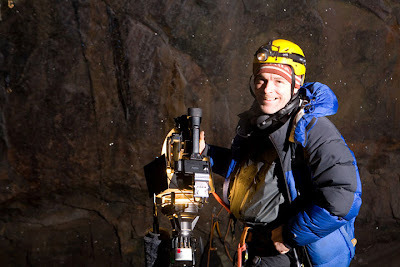 Thin boots with bolt on crampons needed for the highly technical moves. Minimal clothing to be able try and climb hard. That day Dave failed, as he did on many other attempts, all ground up from the start. I was relieved that day. The prospect of seconding the became quite terrifying as I waited. In theory I can climb that sort of difficulty, about M11. 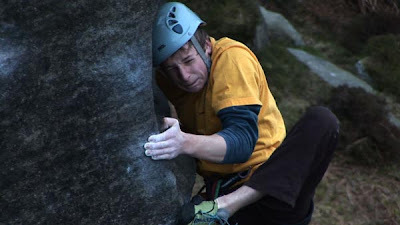 The reality of course is that continental mixed climbing is a million miles away from the full on Scottish experience. An M11, pre-practiced, protected by bolts, 15 minutes to climb it. This is all quite different from the huge scottish walk-in, blizzard conditions, onsight climbing, 12 hours on the route (in this case). So yes. I was quite terrified. So how was I going to second the route? It had taken Dave many attempts and still he was falling off. How could I possibly second the moves, clean, first time. Not a hope in hell. 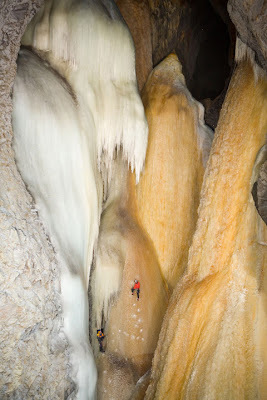 And the crux pitch is a traverse, so each failure means falling down into the void. Scary. 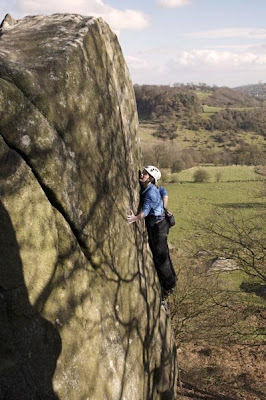 The only prospect for seconding this was aid climbing, or cheating. 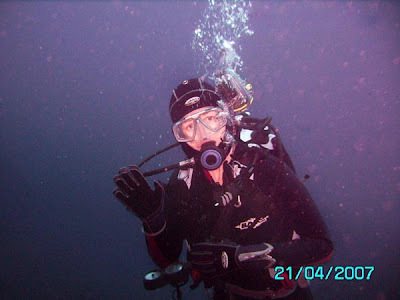 The latter being one of my specialist subjects. At 8.30 we heard from Dave. 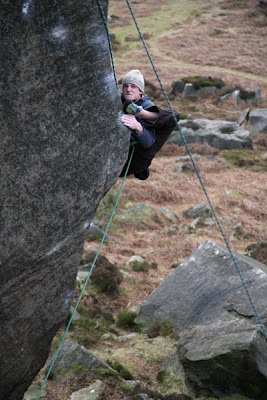 He phoned to say he was still 2 pitches from the top (and had left the house at 6.00am). Relief. Dave was back off the hill at 11.00pm. His hardest winter day ever. A new grade XI,11 finally climbed. So our appointment to go and film another XI,11 the next daywith him looked rather in doubt. But no, Dave was still up for that! so we retired to get ready to film the next day. Dave MacLeod on The Hurting, XI,11. Hot Aches Images. Monday saw us in The Cairngorms, to film The Hurting. Another of Dave's routes, and an extremely dangerous and technical climb. 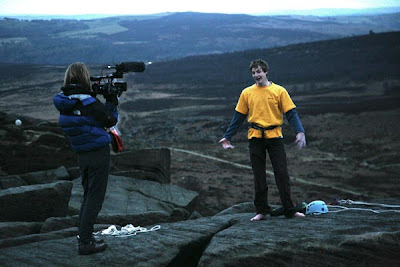 I had abseiled this in preparation for filming, and again thought about the prospects of climbing it. About M11, but two crux sections with groundfall certainly should you make a mistake. Tiny holds, sometimes your pick just behind crystals. 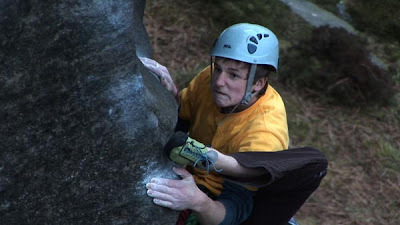 I can't stress enough how different this is to the kind of mixed climbing abroad. Monday was a wild day, -25 degree windchill, wind blowing vertically upwards, freezing your eyelashes and our camera lenses. Buffeted all over the place. Totally wild and crazy. 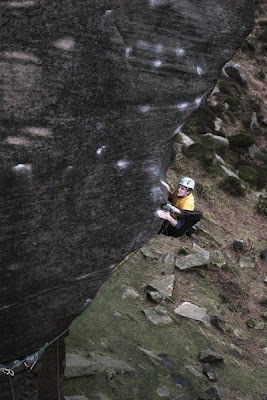 So for the second day in a row MacLeod climbed an 'Scottish Winter XI,11' the two hardest routes in the UK, and both unrepeated. 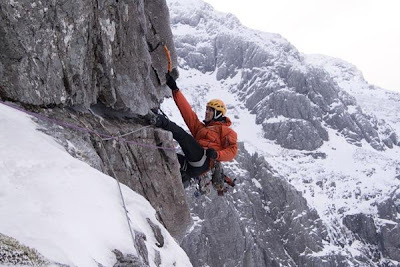 Congratulations to Jo French who climbed Dave's Ben Nevis route with him. You must be mad! Pete Whittaker on the Crux of Dynamics of Change. E9 7a. Hot Aches Images. 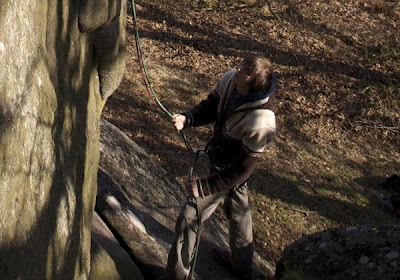 When the belayer asks to have their own spotter… you can tell the route is somewhat serious. Dynamics of Change climbs the arete to a break, then swings outsteeply to the right before joining Brail Trail at the top . Hot Aches Images. 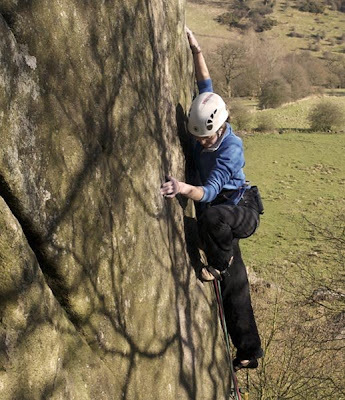 Last Great Problems on England’s grit stone are something quite special; unclimbed lines that are talked about, looked at, and occasionally tried by the best climbers of each generation. 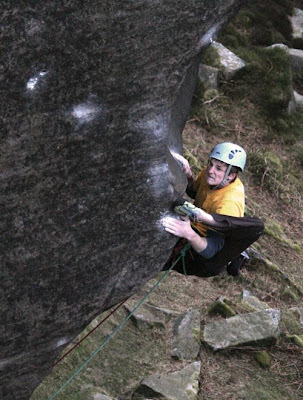 The LGP List compiled by J Reid is well known amongst British climbers. 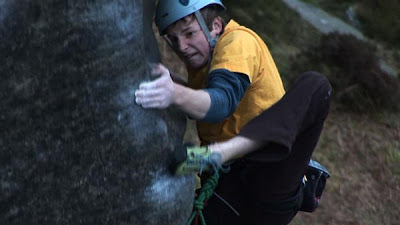 The climber we went to film was the youngest from the Whittaker clan. So young in fact, that he had to get permission to leave school early that day in order to have enough time for the climb before it got dark. We met Pete at the crag at 4:15pm. Two hours of daylight remained. 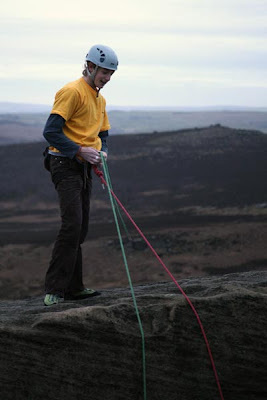 Pete Whittaker final top rope, cutting loose, on Dynamics of Change. E9 7a. Hot Aches Images. He swiftly got to work brushing holds and practicing the moves. His entourage arrived, mother and father on belay duty, and sister Katy to watch nervously and support. 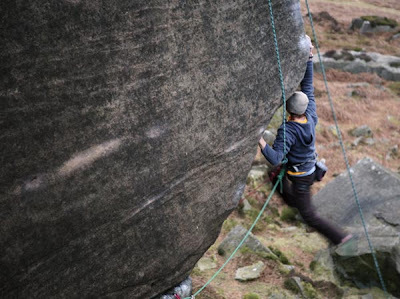 Pete Whittaker final top rope, the crux of Brail Trail - at t he end of Dynamics of Change. E9 7a. Hot Aches Images. As Pete tried the moves, this was the first time I had seen anyone on the line. As I watched, my jaw dropped. I could hardly believe what I was seeing. 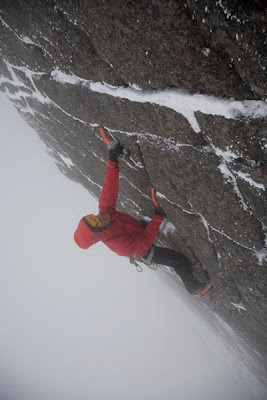 After the initial arête, the wall becomes steep. 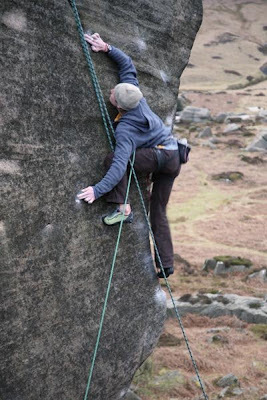 Here Pete dynos to a small hold (the point at which the arête joined Brail Trail) cutting loose, legs flying. Effort. E9 7a. Hot Aches Images. From here, miles above his gear, he then swings a heel up between his hands, and gradually rocks over on it. Rocks over on it. How? But somehow he was managing to. What remains ahead from this point is the final crux section of Brail Trail, but without any of the gear. Effectively soloing from this point. You might remember that this is the point at which Dave Jones falls on Brail Trail in Hard Grit. It was 6 o’clock. Pete decided he would go for the lead. He hadn't even managed to link the moves from the dyno to the top, but he decided that he was ready. 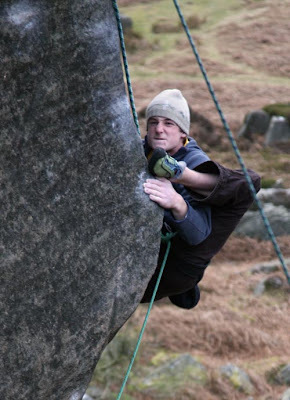 The atmostphere at the crag was tense. His family usually seem pretty blase, certainty that Pete will succeed. Today everybody was clearly concerned. Pete Whittaker cutting loose on Dynamics of Change. E9 7a. Hot Aches Images. As Pete climbed higher I was shaking. The other camera people were shaking. His family were shaking. 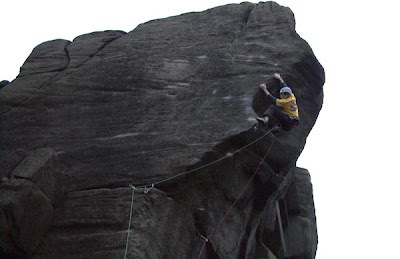 And as he reached the crux Pete was shaking. Everybody was willing him not to fall off. The rock over move took an age, inch by inch he fought and grimaced and slapped and pulled. 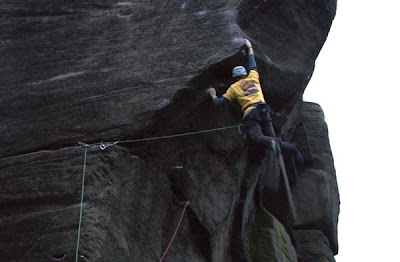 "On top-rope, on top rope" was the mantra he kept repeating as he tried to gain composure for the final crux. We could hardly watch. Pete did the final moves and pulled over the top. Relief and emotion was everywhere. Some spectators had crept up unnoticed to watch, and there was a spontanious round of applause. Pete was now dizzy and had to lie down on the top. Pete Whittaker on Dynamics of Change. E9 7a. Hot Aches Images. Another last great problem has fallen. A stunning line. An audacious ascent. 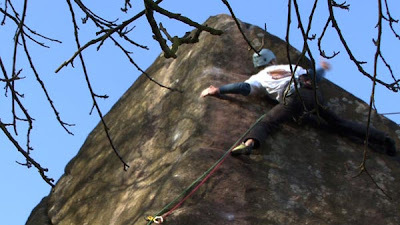 At just turned 17, this is surely the youngest ascent of an E9 ever. As for the grade. It would be hard for Pete to give a bigger grade to a route with so little experience under his belt. Pete elated on top. Lynwen Griffiths filming. "That's a fantastic effort by Pete. I threw a rope on it last year to look at the possibility of a Braille Trail direct start and it seemed like it may be possible for someone, but it was way too hard for me that day. It's technically at least 2 grades harder than BT and unless you're able to reach left into the BT slot for gear you'd be looking at doing the crux of BT with a possible ground fall, which would make it definitely E9 and maybe harder. Even with the BT gear it's still cutting-edge stuff." [Note that Pete wasn't able to use the gear on Brail Trail]. Katy Whittaker and Lynwen Griffiths, reflecting afterwards. Hot Aches Images. PS. 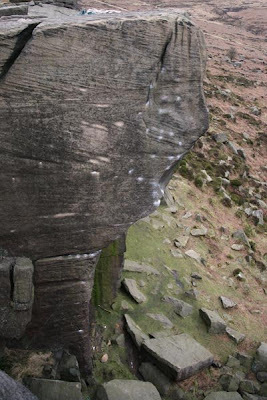 No Bouldering Mats were used to protect the landing from a fall. Lynwen Griffiths is one of the Hot Aches' regular camera crew on this year's productions. 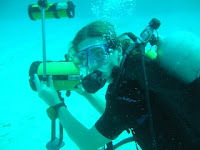 Her 12 years of experience filming at locations as varied as the Belizian jungle and K2 is all pretty usefull stuff. Below is a short film from her production company, Bamboo Chicken. "3 Lakes Challenge" has just won an unlikely Commendation at the British UnderWater Image Festival. I use the word "unlikely" because, as the judges noted, it didn't have a single underwater image in the whole 9 minutes.